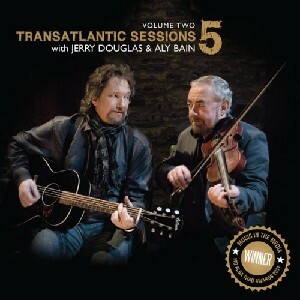 Transatlantic Sessions: Series 5: Volume Two, The Scottish Music Shop - The Best Selection of Scottish CDs and Scottish DVDs. Second collection of music from the fifth TV series. The Transatlantic Sessions was winner of the Music In The Media award at the MG ALBA Scottish Trad Music Awards 2011. Aly Bain (fiddle, viola), Jerry Douglas (dobro, lap steel guitar, guitar), John McCusker (fiddle, flute, whistles), Nollaig Casey (fiddle, vocals), Russ Barenberg (guitar, mandolin), John Doyle (guitar, vocals), Michael McGoldrick (pipes, flute, whistles), Donald Shaw (accordion, piano, keyboards), Danny Thompson (bass), James Mackintosh (percussion).